BECIL is stand for “ BROADCAST ENGINEERING CONSULTANTS INDIA LIMITED”. Government job application forms related to this BECIL Recruitment process may be obtained from BECIL’s Corporate Office: C-56, A/17, Sector-62, Noida-201307 or you can downloaded the application form from the following website: “ www.becil.com”. All Indian fresher candidates are eligible to apply for this BECIL Career making open opportunity 2018. 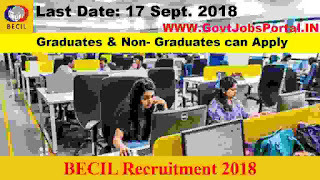 BECIL Recruitment department said that they are going to filling up total 50 vacant positions of Data Entry operators. We personally took this information from the BECIL website, and share with you readers. So all the right related to this content which we shared goes to the BECIL Recruitment department only. We are just sharing this information from the following website: “ www.becil.com”. The whole information related to these Government jobs for Data entry operator is given below in this article, so read the whole information carefully before moving to apply through offline process. We share the Advertisement as well as the application form link at the last of this article. So check IMPORTANT LINK section at the last for more information. What are the various Eligibility Criteria for applying this BECIL Recruitment? 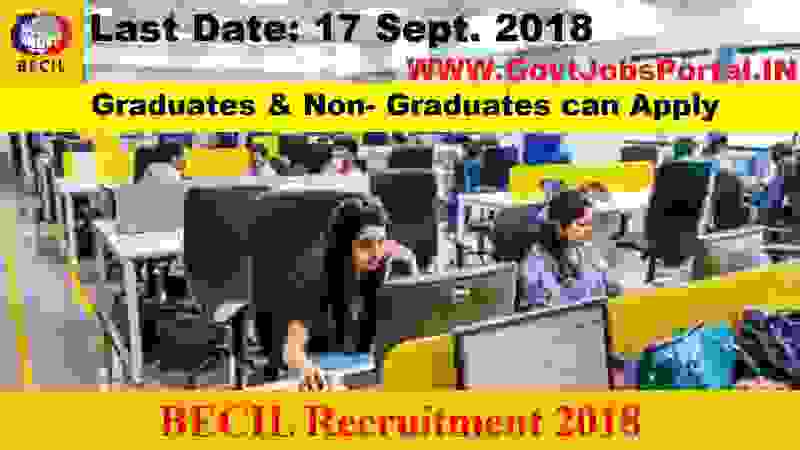 Educational & Other Skills: All Indian candidates who have completed their Graduation in any stream from a well known university can apply for this BECIL Recruitment process. Graduate applicants must have the typing speed of 35 WPM. Non-graduates means 12th pass candidates can apply for these Government jobs in India and must have the typing speed of 35 WPM. Age Bond: As we checked the official Advertisement, we did not find any age criteria for applying these Government jobs. Age limit Not mentioned in the official file. What is the Application Fee for applying this BECIL Recruitment? Paying Method: Non-refundable Registration fee should be pay by Cash / Card or demand draft drawn in favor of BROADCAST ENGINEERING CONSULTANTS INDIA LIMITED payable at New Delhi may be submitted to Assistant General Manager (HR) in BECIL’s Corporate Office at BECIL Bhawan, C-56/A-17, Sector-62, Noida201307 (U.P). What is the Process for Applying this BECIL Career making Opportunity? 1. Take the Print out the application from, the link share in the last of this article. 2. After that duly filled in application form along with self-attested photocopies of educational/ experience certificates. 3. Also attached two passport size photograph, Aadhar Card, Pan Card. To Assistant General Manager (HR) in BECIL’s Corporate Office at BECIL Bhawan, C-56/A-17, Sector-62, Noida201307 (U.P). 17TH Sept. 2018 is the Last date to apply. DISCLAIMER: All information which we shared above is take from the following website: “http://www.becil.com/”. So all rights related to the above information goes to this website only.